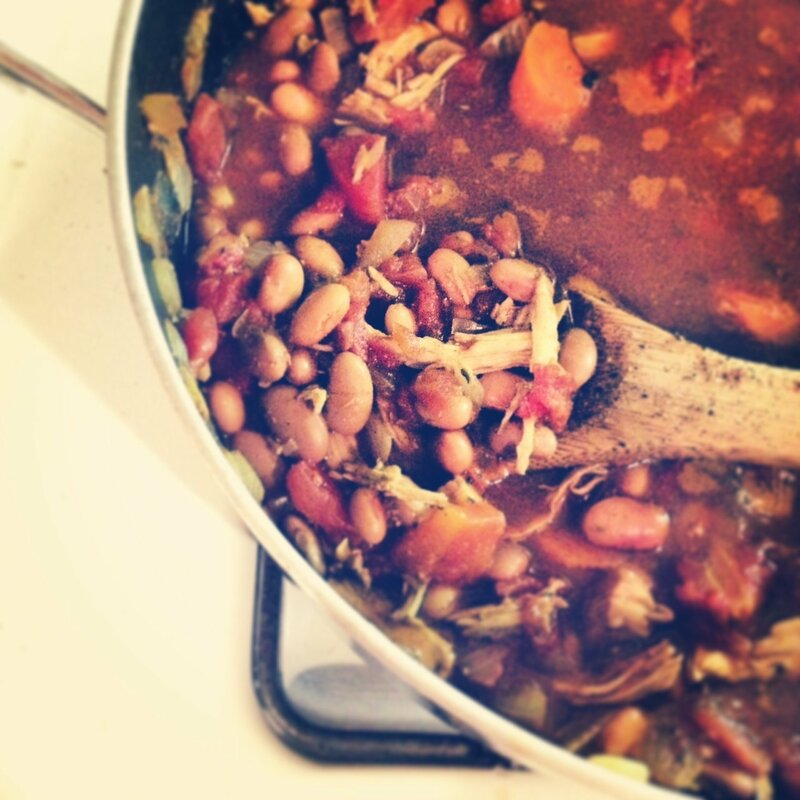 I made this sensational chili last week and it reminded me of my Grandmother because she seems to always incorporate pinto beans into whatever she’s cooking. And for good reason, too! In my opinion, they’re one of the best comfort foods — flavorful and creamy in texture. I devoured a bowl with a side of honey cornbread. Coincidentally, self reflection pairs perfectly with the chili too. Enjoy! 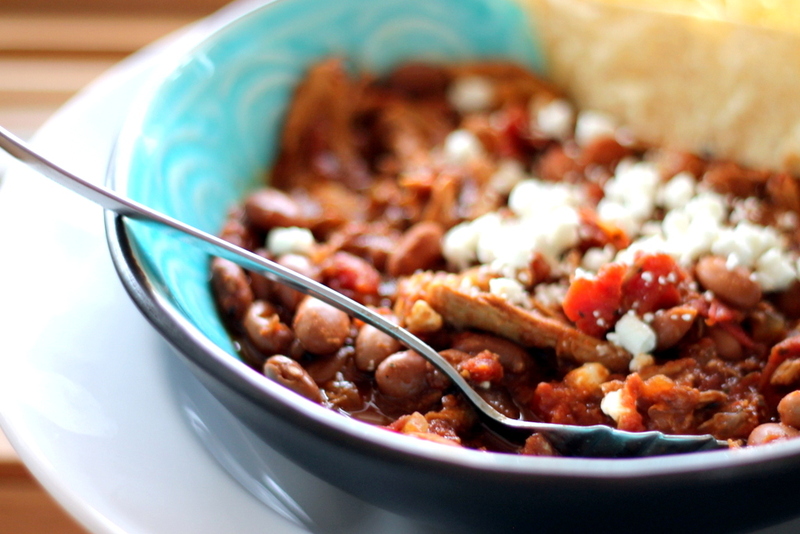 A chicken chili with pinto beans. 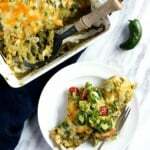 Healthy, hearty and wonderful served with cornbread. Heat olive oil in dutch oven or large pot over medium high heat until shimmering. Add onion and bell pepper and saute until onion is soft and translucent, about 6-8 minutes. Add the garlic and cook a few minutes more until fragrant then add in chili powder, cumin, oregano, salt, and a bit of fresh black pepper and stir for 1 minute more. Next add in the tomatoes, chicken broth, pinto beans, chocolate, cinnamon, tomato paste, and red pepper flakes and bring to a boil, then reduce heat and simmer uncovered for 30-35 minutes, stirring occasionally. To cook chicken: Preheat oven to 400 degrees F. Drizzle or rub a tiny bit of olive oil over chicken and generously season with salt and pepper. 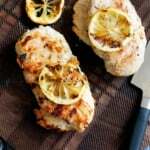 Place on baking sheet and bake 18-25 minutes, baking times differ depending on the size of your chicken breast but remember to cook until juices run clean. Alternatively you could use about 3 cups of rotisserie chicken. Cool chicken for 5-10 minutes then pull and shred chicken with two forks and add to chili, simmering uncovered for about 20 more minutes or until chili reaches desired consistency. 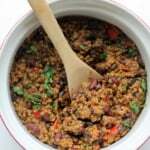 Serve with fresh queso, cornbread or chips if desired. I love topping mine with a little bit of greek yogurt. 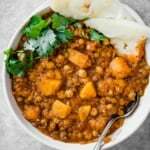 This recipe is freezer friendly and can also be made in the slow-cooker. 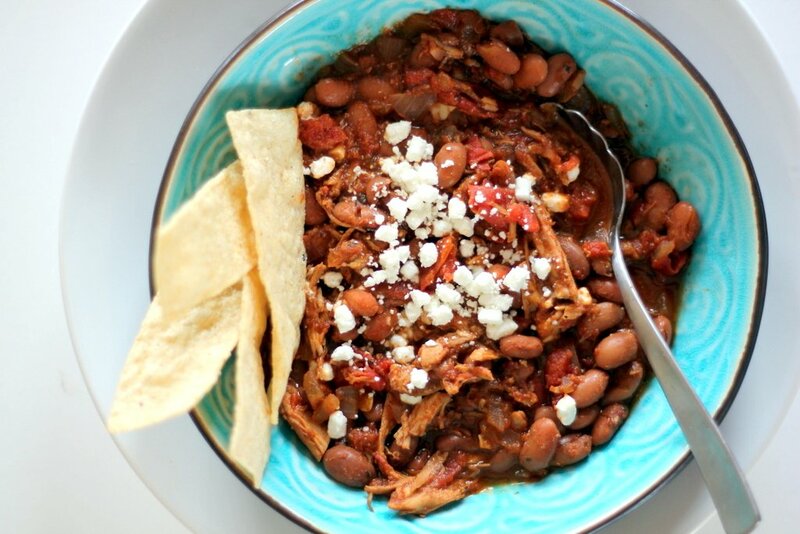 34 Responses to "Pinto Bean Chicken Chili"
Hi – I was unsure about adding this chili to my list of dinners to try until you mentioned your grandmother. 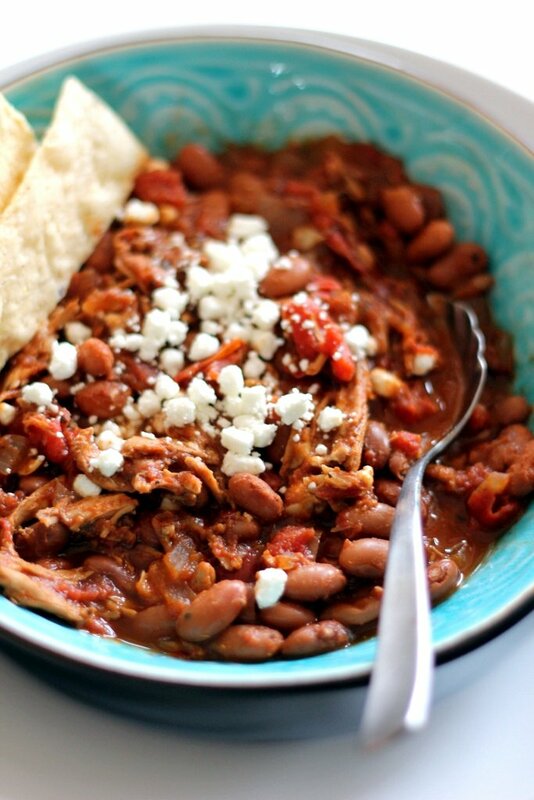 Who is to argue with a grandmas wisdom of adding pinto beans or what have you to a dish. I hope this year turns out to be fantastic for you. 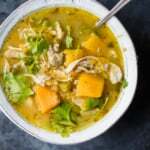 Love chicken chili, one of my winter favorites! p.s. You’re doing great, girl. Passion for what you do will get you everywhere and will keep you happy more than sad while you’re doing it. I can’t tell you how many times a day I say to my girls (2 and 4 yrs old), “Choose to be happy.” Good lesson for us adults too, right?! from someone who is twice your age, I am motivated by the years I wasn;t living my authentic life when I was younger. Those seemingly ‘wasted years’ plus my need to prove I’m not a failure, just because I have failed, is what keeps me ready for anything,. Seek the Truth and you shall find your truth. p.s. Knowing that I can’t go back to what I was before also keeps me moving in the forward direction. Hmm…thinking about it, I would say different things inspires me on different days to push me to become a better me. Most of the things that inspire me, I would say, are unexpected. Such as stories I hear/read, things I see in life, people I know, etc. 🙂 I can`t wait to see what you`ll be doing. 🙂 Good luck! You are truly amazing and an inspiration. Keep up the fabulous work! It sounds like we’re a lot alike and I really relate to everything you’re saying. There’s a lot on the line but I think we’ll always be happier for pursing our dreams instead of wasting life in a dull office job. Keep up the good work! I’m loving this chili. Also, I want this chili in my life like NOW. I think the very best motivator is yourself! Only you know how badly you want something, so only you can push yourself to get it. Even though your year has been filled with ups and downs, it sounds like it’s been a good one if you’ve been going for your dreams! Ouf! I came here for a chili recipe and will leave with thoughts about where my life is going! Im 24 and never really failed, but only because I never try. And that I know I will regret. Monique – thanks so much for sharing your thoughts – I can definitely relate. I am a BIG fan of your work, and all this dedication will definitely pay off! Oh baby! This chili looks amazing! I love the cute picture of you! Sorry I haven’t commented in a while. I need to get caught up! My own passion is what keeps me going. And the desire to prove wrong everyone who said I “can’t” do something. Turn all those negatives into positives — that’s my motto! Why in the world are you putting chocolate in there? And cinnamon? Would you use frozen chicken breast for the crockpot? I made this for dinner tonight and OMG, it was so good! I will definitely be making it again! I had it with gluten free corn muffins and some tortilla chips crushed on top. 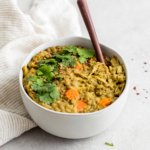 Thanks for a great GF, dairy-free, soy-free recipe! I made this tonight and it was AMAZING!!!!!! The chocolate and cinnamon add depth and deliciousness to the flavor. I can’t wait for lunch tomorrow (left overs )!!! Is it possible to make this without the chocolate? 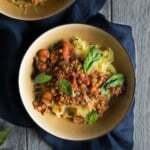 I’m sure these chili recipes are delicious but unfortunately I haven’t found a way to download them short of downloading the whole site! In the recipe if you click the white space below the cook time it will bring you to a printable recipe! OMG, I made this today and it was awesome!!! My 12 yr old and hubby also devoured it! Kudos to you Monique for a great recipe. I wondered about the chocolate and cinnamon also, but I went with it and its delish!! Amazing! Glad everyone loved it. The chocolate + cinnamon seems strange but it’s SO good.